Details: Winchester has set the world standard in superior handgun ammunition performance and innovation for more than a century. Winchester has been the first to answer the call to arms by producing billions of rounds of small-caliber ammunition for the United States military and its allies. 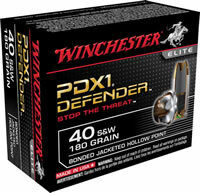 The Winchester Supreme Elite Bonded PDX1 was chosen by the FBI as their primary service round. The Bonded PDX1 is engineered to maximize terminal ballistics, as defined by the demanding FBI test protocol, which simulates real-world threats. The proprietary bonding process welds lead and jacket together to work as a unit controlling expansion and providing superior retained weight. The hollow point works with the bonding process for outstanding performance through tough barriers and impact velocities/ ranges. The jacket notching with six segments help promote positive, consistent and programmed expansion at a variety of impact velocities.